This was recorded a few weeks back over the phone, thanks to Toni Pennacchia for interviewing me. 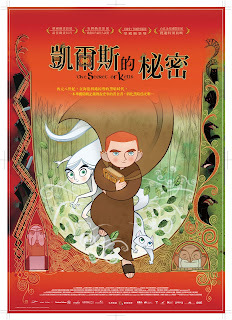 The Secret of Kells, a feature-length animated film about a the nephew of a monk learning the art of illuminated manuscripts during the era of Viking invasions, was way too scary for my two kids. The KidFilm program says six and up, and they are probably right. I shut off the movie before the two and four-year-olds got too scared and ruined a good night’s sleep. The movie, however, was phenomenal. What’s lost in the proliferation of digital animation is the art of animation as hand-craft – the painterliness of animation. There are some old Disney films that really exploited the beauty of this form (I’m thinking of The Fox and the Hound), where the backgrounds and scenery are more than just a representation of the film’s world, but a play of abstracts that profoundly and delightfully affect mood and tone. The Secret of Kells is about the art of illuminated manuscripts, and the very fabric of the movie is enveloped in this style. Brendan is a young orphan who is sent to live with his uncle, an abbot of a monastery. The abbot is obsessed with building a wall to fortify the monastery against the Viking invasions. Brendan is more interested in the work of the brothers who are illuminating the sacred scriptures. When Ireland’s most famous master illuminator arrives, Brendan becomes his pupil against his uncle’s will. As the abbot prepares to guard the future of the monastery’s physical survival, Brenden becomes the only hope for the survival of the art of illumination. Brendan’s apprenticeship becomes a quest and it takes him into fantastical illustrated worlds of dark forces, as he searches for a secret crystal that is the aid of the artist. The story is exciting and compelling, but it is the sheer beauty and originality of the animation that makes The Secret of Kells such an engrossing watch. Even if you don’t have kids, this is probably one the best films playing in local theaters this weekend. Pardon this review if you’ve already read the thoroughly well written review by Charles Kenny, I’ll try to take another perspective on this one. On Wednesday night, The Children’s International Film Festival hosted a screening night at the Soho House in Hell’s Kitchen. The screening room was small and I happened to be 15 minutes late and missed out on what ended up being the most comfortable leather seats I have ever sat in (for the credits, that is). I digress, sitting on the floor did not hamper the mystical experience that is The Secret of Kells. I have to say it has been an incredible year for smaller budget and independent animated features. The main reason for this small screening was to get some buzz built up for the upcoming award season. The Secret of Kells really is a unique film because the quality on a whole is so high. Often films have to sacrifice in places where they just couldn’t make up the money. The design, sound, performance, compositing, and writing were on par with work big name studios with bigger budgets and much larger staff have produced. Now onto the film; The Secret of Kells is a story about a young orphan boy named Brendan living in a walled in town named Kells. Brendan is being raised by his stern and protective uncle who also happens to be the abbot, Cellach. One day Brother Aidan shows up in Kells after his own town, Iona, after it had been destroyed by the norsemen (Vikings). Brother Aidan feeds the wild and bright imagination of Brendan and takes him on as an apprentice to learn illuminated calligraphy. Much to the disapproval of the abbot whose main concern is to prepare for the impending attack of the norsemen on Kells. Throughout the story, our young protagonist ventures into the forest on missions for Brother Aidan where our magical mystery tour takes off. It is in the forestry scenes where the art direction of the film really comes to life. The stylization is really prominent from the first frame of the whole film, especially in the forest and interaction with our nymph friend named Aisling. Though there is a clear flat style to the layouts and patterns throughout the film (inspired by the book of Kells itself), often the screen is broken in sections, and the movement of the characters through the shot define the space or imply mystical vastness or passage of time. No part of the screen was ignored and each layout seems so incredibly planned. I fell in love with the dense shots just as much as the more minimal. The design of the film may have been distracting upon the first look, but by the end of the film it was all just so cohesive. The character animators were definitely taking on a modern sense of weight and smoothness of action. The costume design and hair movement added to the whimsical performances. I could have used some more subtlety in some of the performances. The music and sound design of Kells were perfectly paired. The only possible low point I could find was with the song Aisling sings to cast a spell over Brendan’s pet cat Pangur. It just felt strangely long or out of place somehow. The Secret of Kells also leaves the book that is the main focus of the film, to be somewhat mysterious though it has clearly holy and powerful meaning to Brendan. Considering the film was about the protection of the Christian gospels, there wasn’t an overwhelming presence of religion in the film. It played more to the allegory of good versus evil, or dark versus light. The look of the norsemen in comparison to the innocent villagers is a stunning contrast. I left the film wanting more a little. The conclusion of the film felt a bit rushed whereas the beginning and the forest scenes were well paced. I applaud Cartoon Saloon for putting together a feast for the eyes, as well as a warming experience of the human will through times of hardship and invasion. It isn’t often we see animated films showing the experiences of refugees living in fear and finding light in dark times. 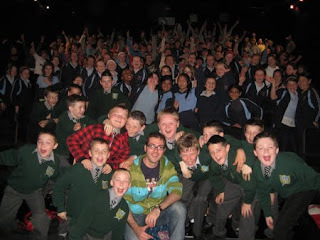 A triumph for Ireland’s film community. A great film. Some high praise indeed from something of an animation legend! The films been gathering some great praise from the preview screenings in the States lately and Eric and Dave of Gkids have been passing the good word onto myself and Paul. One of our Bg supervisors Lily Bernard is back in the studio, working on some Bgs for our Santapprentise co-production with Alphanim , and she was responsible for lots of the beautiful prop designs too. Also working on Santa is Adrien Mergeau another superstar Bg artist and supervisor who is heading to Sundance soon with his short film Old Fangs which we produced here in Saloon last year , and theres master sculptor Jean Baptiste Van Demme who is also painting Santa bgs , he was the man responsible for the very cool Viking designs . Also working with us again is Todor Polson on the bgs for a commercial that Kells animation supervisor Fabian Erlinghauser is directing right now. Tod made the colour script very early on when we were just at the first stages of storyboarding . Captain Sandwiche himself , the Kells Art director Ross Stewart is hanging out here a bit these days he recently directed and designed the very classy "Cailleach an Airgid" musical short for the "Anam an Amrain" series we made for TG4 this Christmas. Maestro Barry Reynolds who made the final character designs and model sheets , supervising all the character model-stuff for the layout posing and animation we did here, and of course the multi talented Remi Chaye who worked on the storyboards with Nora and I.
Screenwriter Fabrice Ziolkowski who majorly helped pull the whole story into its final form after years of development should be very proud too. And then theres the layout team,animators, compositors,production people and musicians to thank too, well too many to mention . With all the good will and kind reviews the film is generating from the likes of John Canemaker, Charles Solomon , Jerry Beck and numerous other famous animation authoritys I hope the whole crew all over the world feel its a reflection of all their hard work and dedication . By all accounts the screening in Hollywood on the 9th went really well. the best public radio stations in the world. My friend Ramsey Avery a former Imagineer at Disney and world wide theme park designer and innovator said this about the screening today, "Just saw The Secret of the Kells. Unbelievably beautiful, audacious, and compelling. If you care one iota for design or world building -- and how they make a well-told story soar -- there has been nothing better in years."